So the time has come where printing stuff off at your local library is no longer an option. Maybe you’re setting up a home office, or maybe you just want a cheaper alternative. Either way, you need a new printer and don’t want to break the bank getting a good one. That’s where we come in. We’ve put together a list of some of the very best printers under 100 USD which are available right now. We’ve managed to find a pretty good range of products, one suited to every possible need, so we’re confident you’ll find one that you like. In the table below you’ll notice that we’ve listed the name of each product we’ll be reviewing, as well as a couple of its relevant specifications. Don’t go making a decision just yet though as we’ll be going more in-depth which each shortly. Now that you’ve seen a little information about our top recommendations, let’s take a closer look at them individually. We’ll be looking for any strengths they might have, any weaknesses and more importantly, trying to decide whether each is right for you. Let’s begin with the Canon MG2520! 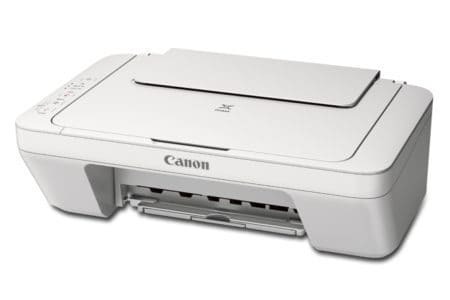 The Canon MG2520 is an attractive printer. Deceptively attractive, actually, given that it’s the least expensive product we’ll be reviewing today, costing less than 70 USD. It has a light silver casing and a very basic control system so even if you aren’t a particularly tech-savvy person, you’ll still be able to use this with ease. This printer has a paper tray which holds up to 60 sheets of paper. This is on the smaller side, as far as printers go, but since the price is so low, we have to limit our expectations a little. It uses a four-color cartridge system (that’s one cartridge each for black, cyan, magenta and yellow ink) which means that if one colour runs out, you can continue to print using just the others. You probably won’t want to print with a limited colour palette, but if you only use the black ink, you don’t have to spend money on colours. This printer isn’t the fastest, but it’s alright. You can print eight black and white pages or four coloured pages per minute, and they come out looking decent. This model won’t get you professional quality prints but images are perfectly recognizable if a little blurred up close. As this is an all-in-one printer, you can also scan and copy documents. If you find the printer a little too loud, switch it to quiet mode. This reduces the speed at which it prints but cuts its sound output by several decibels. Scans are stored at up to 600 x 1200 dots per inch (DPI), which is fine, and the printer has red-eye correction built in, just in case you’d like to scan old photographs. 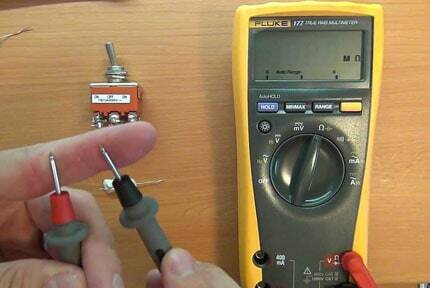 Copying a page takes around 31 seconds and you can make up to 21 copies at a time. The MG2520 is 16.8” wide, 12.1” tall and 5.8” deep, so it’s the perfect size to fit on a shelf or beside your desk. Its light plastic shell helps to keep the weight down, so it’s just 7.6 pounds – the downside of this is that it’s more likely to break if you drop it, but for breakages that aren’t your fault, Canon has got you covered. The day you buy it, you’re provided with a full year’s limited warranty and access to a toll-free phone number which you can call for tech support. Printers are notoriously temperamental, so this phone number could really come in handy. For how little it costs, this printer really holds up. It would make a great addition to your home for casual use, or even for use in a home office thanks to its scanning and copying abilities. More importantly, though, it’s easy to set up and use, plus it’s even covered by a warranty for the first year. Let’s be honest, since this model costs less than 70 USD, even if it breaks after the first year, you’ve probably gotten your money’s worth. 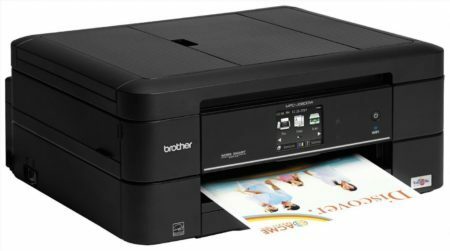 If you just want a printer for casual use around the home, the HL-L2300D printer from Brother is unlikely to be your first choice. For office work, though, there are few which are better at this price point. 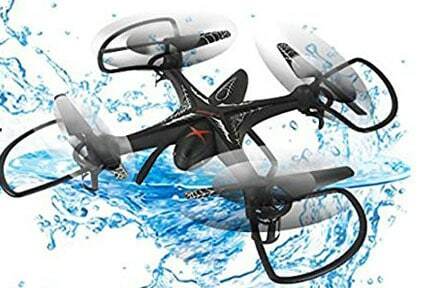 It costs exactly 99.99 USD and has a range of features designed to save you money in the long term. This printer has a plain appearance. It measures 14” tall, 14.2” wide and is 7.2” deep. It’s pretty heavy, weighing in at 15 pounds, so you might want to consider putting it on a trolley or something for easier movement. It has a two-tone grey and charcoal casing which makes it very professional looking and perfect for an office. There’s no screen here – all feedback is given by one of the five status lights on the top of the printer. 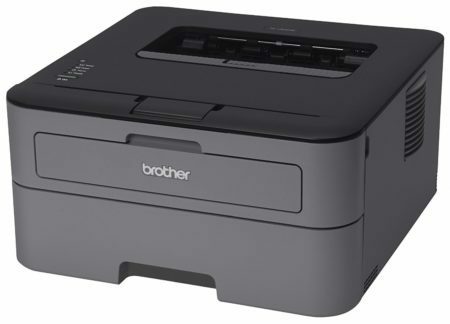 It is a laser printer, so it only prints in black and white. This means that you only need to buy one toner cartridge and given that they last a lot longer than ink cartridges, you’re already saving money. 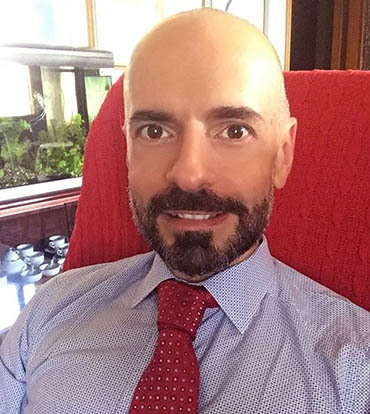 It comes with a starter toner, which can produce about 700 pages, although a standard toner cartridge is good for around 1200 pages, versus about 300 for a high-end inkjet cartridge. The page yield is increased by using this printer’s toner saving mode, although it does result in slightly less crisp text. Without this mode enabled, documents have a DPI of up to 2400×600, which is a little low for a colour printer but just fine for a monochrome one. The duty cycle of this printer is 10,000 pages – far more than the majority of business will need. It has a paper capacity of 250 sheets as well as a single-sheet feeding slot, and can automatically print on both sides with the press of a button. It’s pretty quick, pushing out 27 pages per minute. This means that it takes a little over two seconds to print, which is fantastic. Better still, this model is ENERGY STAR certified. This means that its power usage is low, which is not only good for the environment, it’s good for your bank balance too. When printing, it does get a little loud, but if you work in a busy office, you’re unlikely to hear it. This product also comes with one year’s limited warranty, so if it breaks through no fault of your own, you’re covered. Additionally, you’ll have access to free lifetime tech support which is great since printers tend to be pretty hard to troubleshoot. 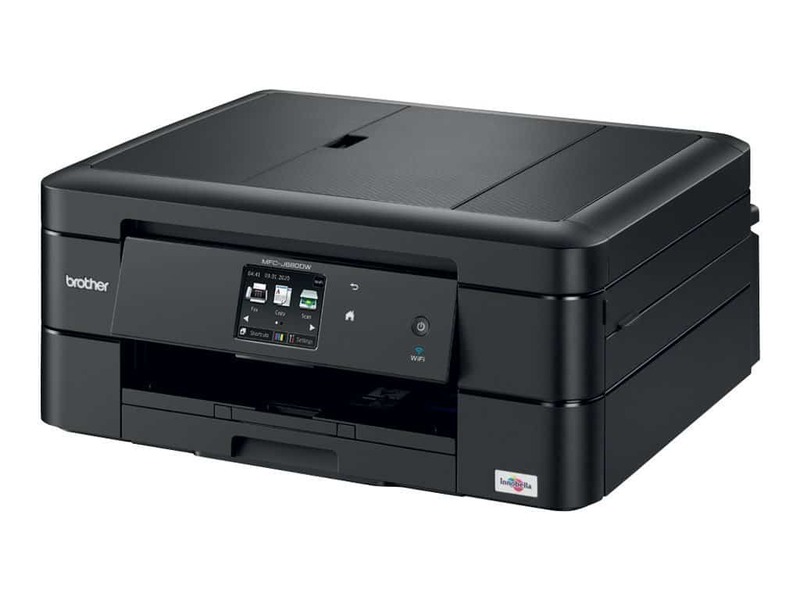 For this price, we’d have liked to see a copier or scanner function included, but as far as monochrome printers go, this is one of the best thanks to its high duty cycle, good per cartridge page yield, and energy efficiency. For a small office, it’s likely to be overkill, but for a larger space, you can’t go wrong with this model. 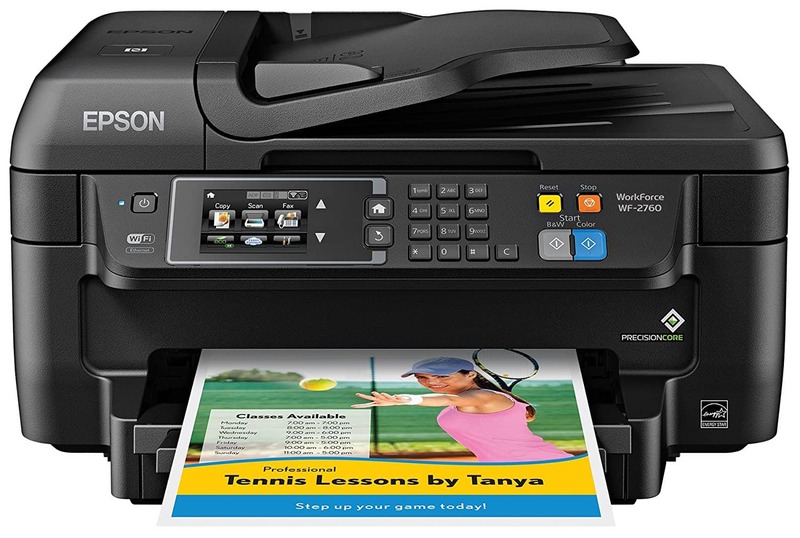 The Epson WF-2760 is a real workhorse of a printer. Sure, it’s not going to be enough for incredibly busy office spaces, but for anything from printing off reports to high-quality photographs, it’ll do just fine. It’s made of sleek black plastic and its control interface is neatly grouped into sections to reduce confusion, making this perfect for the less technically inclined among us. This is an all-in-one printer, so it includes a scanner and copier, but it actually goes further than that, too. It also has a fax machine, WiFi so you can print wirelessly and even an NFC chip which lets you print by touching your mobile to the printer. As you might expect, all this functionality comes at a price. The WF-2760 retails for just under 80 USD, but its versatility makes it worth every penny. It’s a pretty bulky product, standing 16.7” tall, 14.2” wide and 9.1” deep. Further, it weighs 18.6 pounds, which makes it one of the heaviest printers on our list. This is fine, though, since it’s not a product you’ll need to move around often thanks to its wireless printing capabilities. Setup is simple. You can connect it to your network and select a task by using the 2.7” colour touchscreen, plus there are convenient buttons for switching between greyscale and colour modes, restarting a task or stopping one midway. The paper drawer can hold 150 sheets and there’s also a 30-page automatic feeder so you don’t have to stand and wait for your copying to finish. Printing a black and white page takes around four seconds, meaning you can print 13 pages a minute. This is slightly slower than most printers, but the reason behind the long wait is simple: your printouts have a higher quality, with up to 4800×1200 dots per inch. 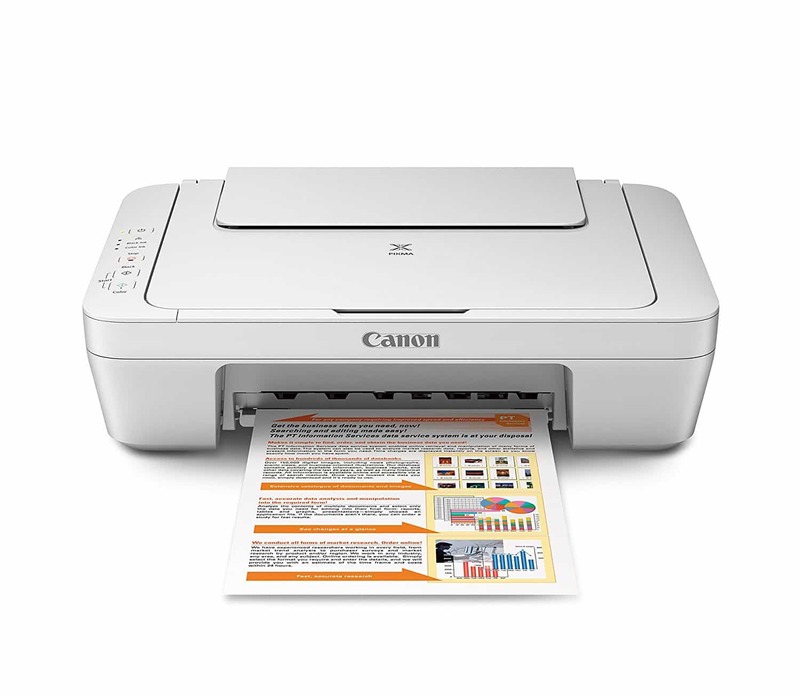 This printer is ENERGY STAR certified and can also automatically print on both sides of the page for less wasted paper. It has a monthly duty cycle of 3000 pages, which is more than enough for a small or home office. Also, it uses a four-cartridge ink system and can print using the remaining colours when one of the cartridges runs out. It even comes with a one-year limited warranty, so not only is it efficient and cost-effective, but even if it breaks, you’re covered. In short, this printer is ideal for a home office due to its high duty limit and features like automatic duplex printing, feeder tray and ease of use. The NFC touch to print technology adds a degree of security to your printer and allows you to track who printed what, and when. The only real downside we can find is its size – it’s pretty large and not everyone will have that much free space. Despite this, if you can clear as much room as it needs, you won’t be disappointed with its results. 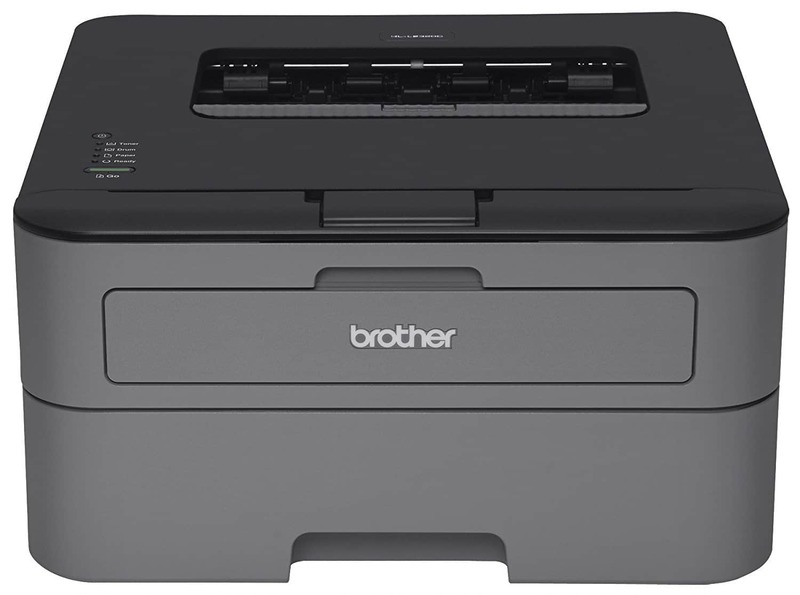 The Brother Printer MFC-J680DW is a fantastic printer for offices big and small. It has the wide range of functionality that you’d expect from an all-in-one printer and looks sophisticated to boot. It sneaks in just under our budget with a retail price of around 99 USD, but whilst it’s the most expensive, it’s still worth buying and we’ll explain why below. It has an understated appearance which helps give it an air of professionalism. This printer weighs 16.8 pounds and is 13.4” tall, 15.7” wide and 6.8” deep, so it can easily be placed on a deep shelf or table. It features a 2.7” touchscreen which can be tilted upwards for a better viewing angle if the printer is located somewhere low down. Its paper tray can hold up to 100 sheets at a time and supports paper up to 8.5×14” in size. This printer has a monthly duty limit of 2500 pages, but in reality, most business won’t have to print anywhere near this amount and if they do, they generally look for more expensive printers. There’s also a 20 sheet automatic document feeder so that you can queue up copying tasks without having to wait around for each page to complete. One of the best things about this printer is its versatility. It has an incredibly simple setup and allows you to connect it to a router via WPS. This means you don’t even need to know the network’s password – just push the WPS button on the router and tell the printer to connect to it. Once this is done, any computers connected to the network can print remotely. This works for mobile devices too, and many of the most popular remote printing apps are supported including AirPrint, Google Cloud Print, and Brother iPrint. Double-sided printing is possible and can even be automated, as can two-sided copying. This means you can reduce the amount of time it takes to copy double-sided documents by up to 50% and as we all know, time is money. As an added bonus, once a document is scanned, it can be directly uploaded to your cloud service of choice, with Google Drive, Dropbox, Facebook and Onenote all supported. Like the other printers we’ve seen, this one comes with a year’s limited warranty, but you also have access to free phone-based tech support for as long as you have the product. This is sure to come in handy at some point, either during setup or when things inexplicably stop working down the line. All things considered, this printer is pretty perfectly suited for office work. The paper tray could be larger, it’s true, but the wireless connectivity options and double-sided scanning are invaluable if your company uses a lot of paper. Additionally, in a business setting, when technical problems arise it often means losing a lot of money and the lifetime tech support will help you iron out any issues that arise as soon as possible. Buying a printer doesn’t have to be a nuisance. Sure, they seem complicated at first, but they’re actually pretty simple once you know what you’re looking for. We’ve put together a brief guide to some of the more important considerations you should make before paying any money for one, so take a few minutes to read it – it could save you some money down the line. First things first, you need to think about paper. Boring, we know, but it’s important. What sizes of paper can you print on with the model you have in mind? A4 is accepted by just about everything, but things like envelopes or smaller paper sizes might not be supported. How much paper can you fit in the drawer? Larger amounts mean less frequent refills but may also mean more frequent jams. Do you print hundreds of documents per day? If not, you probably won’t need a massive paper tray. If you do, and you need to scan or copy lots of documents, you might want to find a model that has an automatic feeder. This will let you queue up documents for copying whilst you’re off doing other things. Next, try and find the printer’s monthly duty limit. This is the number of pages which can be printed each month whilst keeping the printer running as intended. Printing more than the duty limit can lead to increased strain on the components and ultimately, a shorter life, so make sure you buy one with a limit that’s above what you normally print. The kind of printer you need depends on your circumstances. If you never need to print images or print in color, a monochrome printer might be the better choice. On the other hand, if you’d like to print photographs, you’ll want a printer with a high dots per inch (DPI) value. There’s more to it than just that, obviously, and if you want to learn more about getting the best printouts possible, take a look at the article here. Do you need to print on both sides of the page? Get a duplex printer. These can be either automatic (it prints on both sides at once) or manual (where you wait for it to print, turn it over and let it print again). Automatic is generally preferable, but ultimately, it’s your decision. You can also find printers which scan both sides of the paper, and these are invaluable in businesses where there’s a lot of paperwork involved. If your office is quite large, you might find the ability to print wirelessly from your devices useful. This also means that you can print directly from your mobile devices and often printers with this functionality can store scanned documents in the cloud too. Not everyone will need this, but as we move into a more clutter-free society, there’s very little reason to keep a wired printer around. Every printer in this list is perfect for someone, but one amongst them stands out from its competition as more versatile, more useful to the majority of people and ultimately, the best. 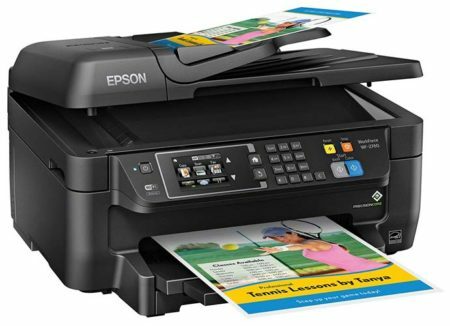 The Epson WF-2760 All-in-One does everything you’d ever need a printer to do whilst remaining reasonably priced and simple to use. It’s a bit larger than most, but if you can look past this, it’ll take care of you for years. We’d like to think that this article has been helpful to you, and you can let us know for sure by leaving a comment or rating below. We hope you’ll come back the next time you need product advice, but until then, have a great day and thanks for reading.